2. Push the strap buckles forward and completely loosen the strap. 3. Lift the strap and rest your chin onto the bottom of the mask. 5. Adjust the strap by pulling the end to make sure the mask is well sealed. 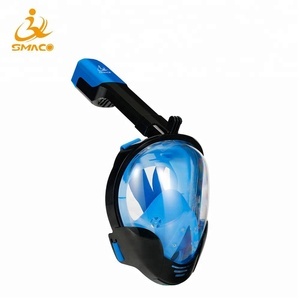 professional diving mask Product Overviews scuba diving equipment professional diving mask/swimming diving training diving glasses Mask Elements Element Lens Frame(Out) Frame(Inner) Skirt Strap Buckle Material Tempered Glass PC plastic PC plastic Liquid silicone Liquid silicone PC plastic Spec 4.0mm thick A standard A standard Food grade Food grade A standard Available Color clear black, plaid grey, yellow, blue, clear black, clear black, clear black, clear black Welcome customized colors! 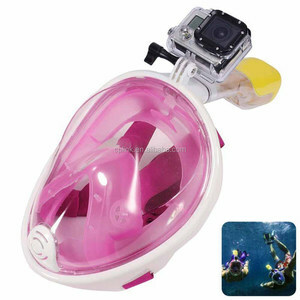 Specification Name scuba diving equipment professional diving mask/swimming diving training diving glasses Item Diving mask Article No M21S Logo not available, accept customized logo Size 12.5cm*11cm Net Weight 220g Suitable Group Adult Special treatment Not available, welcome customized design MOQ 50 Units Leadtime 20-30days, depends on quantity Service OEM & ODM Source Factory direct supply Advantage 1.suit for all faces, double lens diving mask 2.flexible soft liquid silicone skirt and strap diving mask, ensure perfect face fitting 3.light weight diving mask, convenience for taking along 4.tempered glass lens diving mask, high definition and high p ressure resistant, ensure clear sight under water and safe for eyes. 5. fast adjustable buckle, convenience and easy adjust 6. 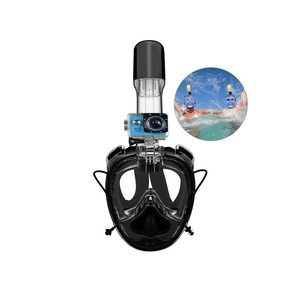 CE certificated, eco-friendly and non-toxic diving mask 7.Waterproof perfect performance 8.Prescription lens optional Packaging & Shipping Above is our ordinary packing, accpet customized packing method Related Products 1. Supply and be specialized in high quality, eco-friendly, professional diving and swimming products 2. Serve worldwide customers 3. ODM service, develope new styles, welcome customized idea and designs 4. OEM service, welcome customized logo and colors 5. Offer different package, PP bag, PP box, mesh bag, blister or any others you like 6. Supply diving accessories, diving equipment parts/service kits 7. Small MOQ, timely producing and competitive prices 8. Excellent after sales service 1.15 years experiences in diving equipment production, import and export business 2.More than 10 years OEM factory for Oceanic, as well as Finis 3.Own mold house, professional techinians and development staff 4.serial diving equipments making machines 5.professional and skilled customer server and quality control. Is a collection research and development design, production, marketing for the integration of the whole industry chain enterprises for export. 3) Q:How long is the warranty time for your products9 A:Our officially promised warranty time is one whole year after delivery at best. 5) Q:what's the shipment terms and delivery time of your company9 A:Well, it depends on the quantity of your order. 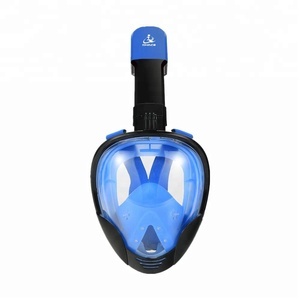 Alibaba.com offers 6,473 scuba mask products. About 79% of these are diving masks, 1% are party masks, and 1% are face mask. 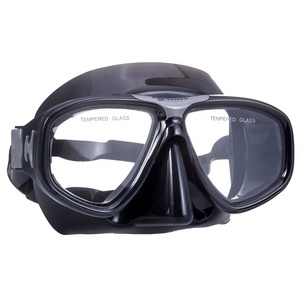 A wide variety of scuba mask options are available to you, such as free samples, paid samples. 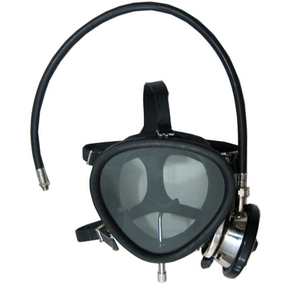 There are 6,408 scuba mask suppliers, mainly located in Asia. The top supplying countries are China (Mainland), Taiwan, and France, which supply 99%, 1%, and 1% of scuba mask respectively. 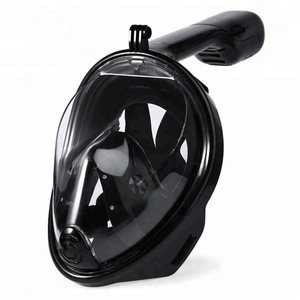 Scuba mask products are most popular in North America, Western Europe, and Eastern Europe. You can ensure product safety by selecting from certified suppliers, including 744 with ISO9001, 256 with BSCI, and 114 with Other certification.